The five countries Azerbaijan, Kazakhstan, Russia, Turkmenistan and Iran are known as the Caspian States because the Caspian Sea shares it's boundaries with these countries. It is of great importance to the world and also for India. In this article we will find out why. 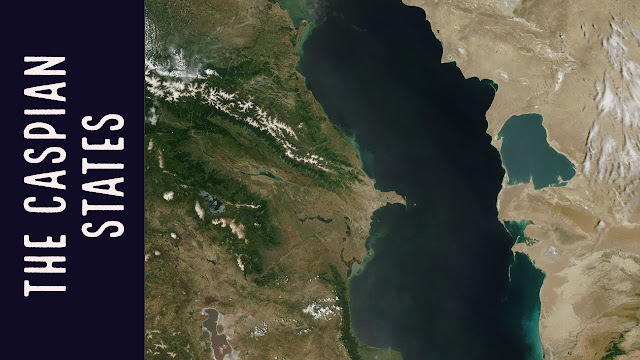 The Caspian Sea is the largest enclosed inland body of water on Earth by area. It is a basin without outflows located between Europe and Asia. It is bounded by Kazakhstan to the northeast, Russia to the northwest, Azerbaijan to the west, Iran to the south, and Turkmenistan to the southeast. It is around 28 m below the sea level. It is more than 1000 km long and more than 400 km wide. It has a catchment area of more than 35 lakh sq. km. The average depth is around 200 m and the lowest point is more than 1000 m deep. It is estimated that the Caspian region has possibly the third largest oil and natural gas reserves in the world (upto 15 per cent of the total reserves of the world). Hardly any of this potential has been used yet, and it is expected that there are much bigger reserves that haven"t been assessed yet. So it is a fairly new source of important natural resources that has not been exploited yet. All of this has given rise to new political drama all over the world. The geopolitics of oil in this region began with the collapse of the Soviet Union in 1991. It has led to an intense investment and development scramble by international oil companies. There is constant competition between major oil companies of the world, powerful nations and the governments of the Caspian countries. India is situated very close to the Caspian region. Oil and natural gas are the most important energy sources and all the countries in the world are trying to get more and more of these resources. If India maintains good relations with the Caspian States, it means India can get a cheap supply of oil and gas. India and Russia are heavily investing in the North-South Transport Corridor (NSTC), which connects the Indian subcontinent to the Middle East, the Caucasus, Central Asia and Europe. It will significantly reduce transportation costs and travel time. India’s Oil and Natural Gas Corp (ONGC) is trying to develop reserves in the Caspian region. The Turkmenistan–Afghanistan–Pakistan–India Pipeline (TAPI) is a natural gas pipeline being developed by the Galkynysh – TAPI Pipeline Company Limited with the participation of the Asian Development Bank. The pipeline will transport natural gas from the Galkynysh Gas Field in Turkmenistan through Afghanistan into Pakistan and then to India.